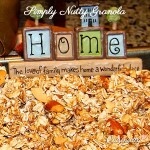 Nothing like a simple homemade granola to fill the house with wonderful welcome home aromas! This granola is not too sweet, so you can just enjoy it plain or add some dried fruit to it, if you like it a little sweeter. It’s filled with oats, walnuts and almonds so it is rich in protein, fiber and healthy oils. Perfect for breakfast with fresh fruit and yogurt, but remember, because it is calorie dense (albeit full of nutrients) a little goes a long way, so I recommend the serving size not be any higher than 1/2 cup, which I think is the perfect amount anyway! It’s so yummy, I just don’t want you to overeat it…because you’ll want to! My dear friend and esteemed dietitian Joy Bauer wrote a great article about just that and I highly recommend you read it (click here for her article) it is so genuine and so helpful! Place walnuts and almonds in a small food processor and chop briefly--leaving chucks of nuts intact. 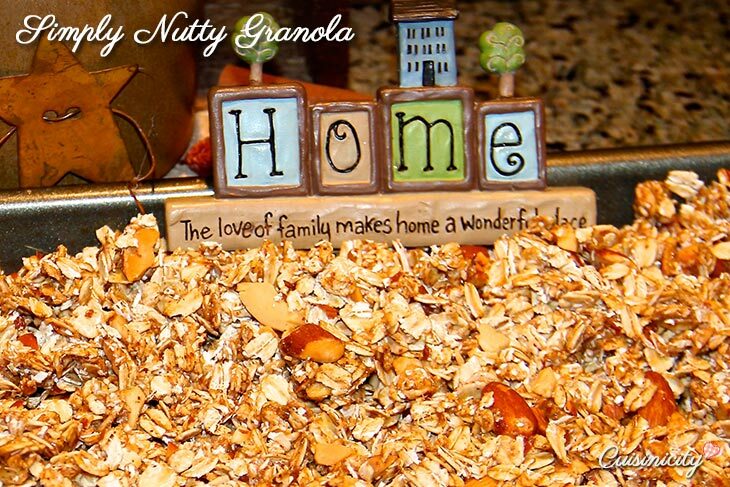 Place the oats and chopped nuts in a big bowl and set aside. Place almond butter and honey in a small pan and heat on the stove for 3-5 minutes to bring to a quick boil, while stirring occasionally, until completely smooth (no clumps!). Spread the mixture on a cookie sheet in one layer and place in preheated oven for 30 minutes, stirring 2 or 3 times during that time, to make sure there are no clumps. Turn off the oven and keep it in there an additional 15-20 minutes. Let cool completely (that's when it will become perfectly crisp), add the cinnamon and chopped dried fruit (if using) and mix well before storing in an airtight container, or zip lock bag. Calories 229, Sat Fat 1 g, MUFA 5 g, PUFA 4 g, Cholesterol 0 mg, Sodium 3 mg, Potassium 207 mg, Carb 30 g, Fiber 4 g, Sugar 9g, Protein 7 g.
Granola was very good. I signed up for Yum, thanks for the tip. What temperature should the oven be preheated to? Oh my goodness, I can’t believe I forgot to write it–it’s 300 F. Thank you so much for pointing it out! I will fix that right away!